The Oregon Wine Competition® will be held this weekend, August 4-5 at Ashland Hills Hotel & Suites located at 2525 Ashland Street, Ashland, OR. Media interviews with the judges will be on Saturday, August 4 at 11:00 am. We ask that camera crews be set-up by 11:00 am. The interviews will be held in Boardrooms I and II located on the upper level of the lobby. I will be the main contact for all media requests. My cell is 202-258-6800. The 2018 panel of judges is made up of four Masters of Wine and two nationally renowned wine writers. There are 341 total Masters of Wine in the world with 47 living in the United States (53 total located in the Americas). 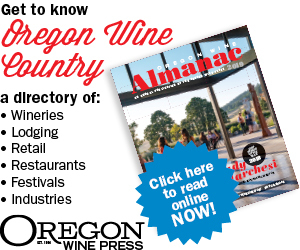 Nearly 100 wineries from across Oregon will compete with close to 350 wines assessed. There are three competition categories which include red, white and specialty. For details about the 2018 judges and the Oregon Wine Competition® please go to the below link: http://www.theoregonwineexperience.com/wine-competition/. Media is invited to cover the Judges Forum on Sunday, August 5 from 5-8 pm in the Grand Ballroom at the Ashland Hills Hotel & Suites. Bree Boskov, MW, the Education Manager with Oregon Wine Board will moderate the panel discussion. Interviews with the judges and Ms. Boskov can be conducted in Constellation Hall from 5-6 pm, the program will be from 6-7 pm and run as late as 7:30 pm. For more information about the location please click on the following link: https://ashlandhillshotel.com/meetings/.